Golden Corral Bourbon Street Chicken Copycat brings all the sweet, sticky, salty and yummy flavors you love right in your own kitchen. Only five ingredients and less than 20 minutes of cook time for an amazing dinner meal the whole family will love! For a budget-friendly all-you-can-eat buffet restaurant, Golden Corral definitely delivers with a wide selection of family favorites. 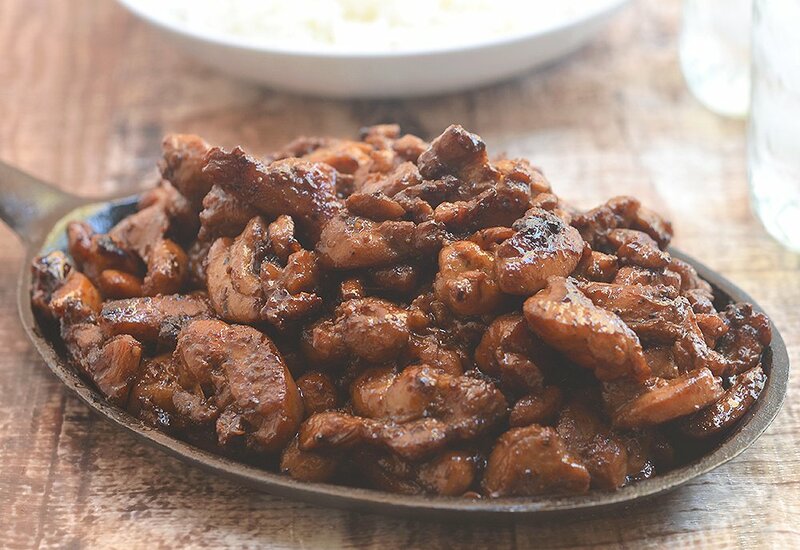 But although they offer a delicious variety of menu items, from dinner classics such as pot roast and meatloaf to Asian-inspired dishes such as Mandarin chicken and fried rice, it’s their bourbon street chicken I always beeline for. A delicious marriage of sweet and savory, it’s absolutely yummy with steamed rice! While the bourbon chicken is worth a trip to the restaurant, I wanted to replicate the same delectable experience at home. I’ve tried a few recipes online which were great copycat versions on their own but on one of our many visits to the restaurant, I pulled my face off my plate long enough to look around and saw this on their wall. The ingredients and the instructions right before my eyes! I was so excited, I wasted no time ordering this brown sugar bourbon seasoning (this is an affiliate link) on Amazon! A big old 13.5 ounces to have on hand anytime bourbon street chicken cravings hit! 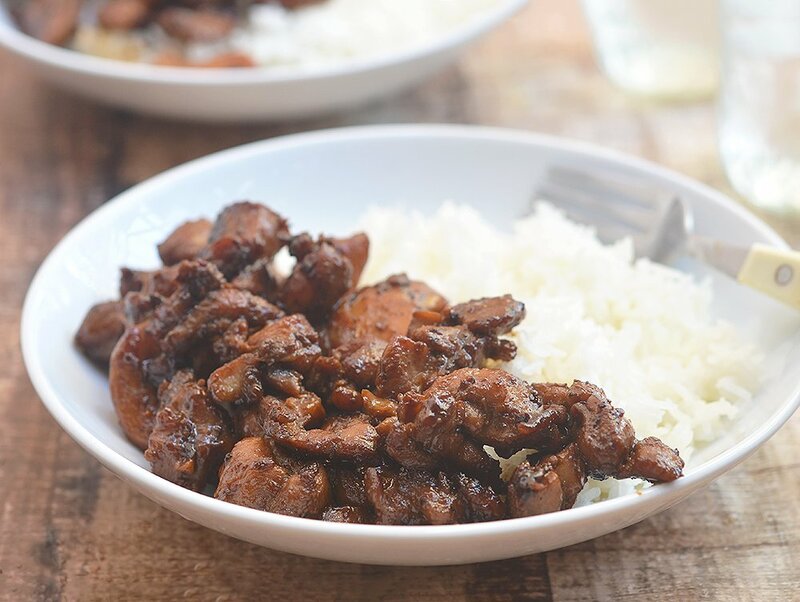 I used Kikkoman teriyaki sauce which is available at most major supermarkets to simplify things a bit but you can easily make your own by combining equal parts of dark soy sauce, sake, mirin, and honey. 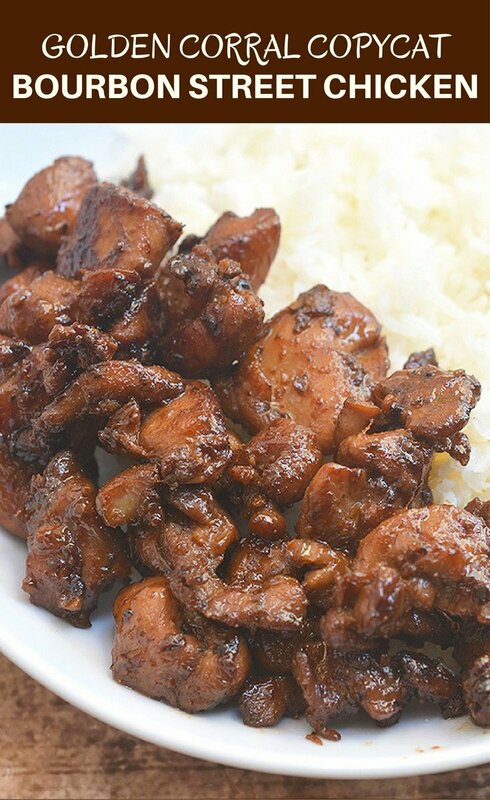 As commercial teriyaki marinade is thinner in consistency than homemade, I like to heat up the final glaze with a bit of cornstarch so it’s thick enough to coat the chicken pieces with a beautiful sheen. Want more copycat recipes? This Woodland Restaurant’s Peanut Coleslaw is our staple dish for backyard parties, this Panda Express Firecracker Chicken Copycat is just amazing as the restaurant’s, we love waking up toIHOP Pancakes Copycat and this Disneyland’s Hot Chocolate Copycat is the ultimate comfort food. Rinse chicken, pat dry and place in a wide pan. 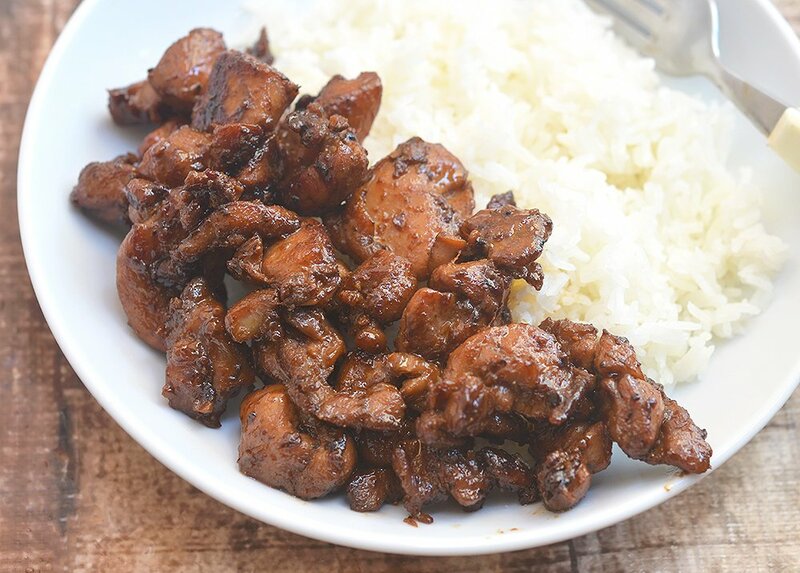 In a small bowl, combine 1 cup of the teriyaki sauce and 2 teaspoons of the bourbon seasoning. Whisk together until bourbon seasoning is dissolved. Pour over chicken and stir to evenly distribute marinade and fully coat chicken. Cover pan with film and marinate the chicken in the refrigerator overnight. Drain the chicken well. On a hot stove top grill or wide thick bottomed skillet over medium heat, add chicken in a single layer. Sprinkle with the remaining 1 teaspoon of bourbon seasoning. 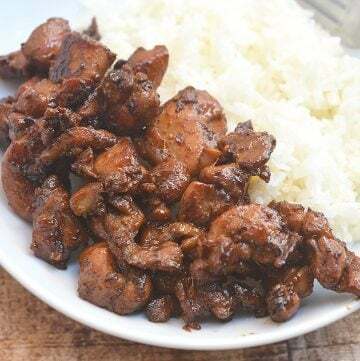 Cook, stirring regularly until lightly browned and thermometer inserted into meat reads 165 F.
Meanwhile, combine the remaining 1/2 cup of teriyaki sauce and honey in a saucepan. Stir until well-blended. Over medium heat, bring to a simmer. Add cornstarch slurry, stirring well to prevent lumps. Cook, stirring regularly, for about 1 to 2 minutes or until slightly thickened and heated through. Transfer cooked chicken into a serving platter. Top with hot teriyaki glaze just before serving. Serve hot. I was so excited about this recipe after seeing the photos at the top of the page. It looks exactly like my favorite dish at Golden Corral! When I got ready to cook the chicken I noticed the cooking video just about the recipe that you posted, and that the finish product looked nothing like your photos at the top of the page or what is sold at GC. I was already cooking it though so I was hopeful it would still taste like it. Nope. It was so incredibly salty and just tasted like a slightly doctored version of regular teriyaki chicken. It tasted nothing like the bourbon chicken from Golden Corral, even if the salt level was decreased. I’m very frustrated that I wasted money not only on the chicken that was too salty to eat, but on a seasoning blend that we won’t even have a use for now. So disappointing. I don’t know what GC you eat at, but truly, this is nothing like the “real thing”. I am so sorry the recipe didn’t meet your expectations. We love this dish at home and I am not really sure what went wrong on your end. If you scroll through the post, you’ll see a photo I took of a board displayed at Golden Corral. It has the same ingredients and instructions as my recipe as I based mine on that. The only reason the video doesn’t look like my photos is that I cooked them longer until almost caramelized for my pictures. Can I use boneless skinless chicken breasts? Thank you for this recipe. I made this for dinner last night & there weren’t any leftovers, even my 2 year old had seconds! It was great, if I were to make a recommendation it would be to use low sodium terriyaki sauce as I found it more on the salty side. I will definitely be making this again, tasted just like GC. Hi. I followed the recipe exactly as instructed, and mine came out lil soupy…I used a regular skillet. Could that had been the problem. I was not satisfied with the results of this dish. I am sorry the recipe didn’t work out well for you. Was the chicken patted dry and drained well before cooking in the skillet? Can I buy brown sugar bourbon seasoning in the grocery store? Yes, you can buy it in the grocery store. I’ve seen in the spice section. Will it make a difference if I don’t marinate the chicken overnight? And if I just used a normal pan rather than a stove top grill? Thanks for sharing the recipe. I am planning to make chicken for dinner tomorrow but I just can’t make up my mind on how to cook it. Now I do! My boys will love this! Thank you! I hope your family love this! I’m always up for trying a good copycat recipe! We love Golden Corral so this one sounds extra yummy! Thanks Tiffany! You have to try this. My husband would go crazy for this recipe! It sounds so delicious! It looks like it wouldn’t be too hard to make which is always a plus for me. I am definitely trying this for dinner. Thank you! I am sure you will both enjoy this! It is our favorite too! I always get bourbon chicken when I’m at the mall. IT reminds me of the food court. So good! Wow! This recipe looks really good! I love teriyaki sauce. This is good for the family. Awesome. This recipe actually looks better than Golden Corrals recipe. My children love eating there but I always think it’s too expensive for what they eat. I’ll have to make this at home for them! Yes, Bianca. So much better to make them at home, and I am sure your children will love this. I have not tried these at Golden Corral, but this recipe sounds fantastic. My boys and husband prefer to eat chicken most nights and this would be a totally new flavor for them. You really have to try this, then! It is really delicious. 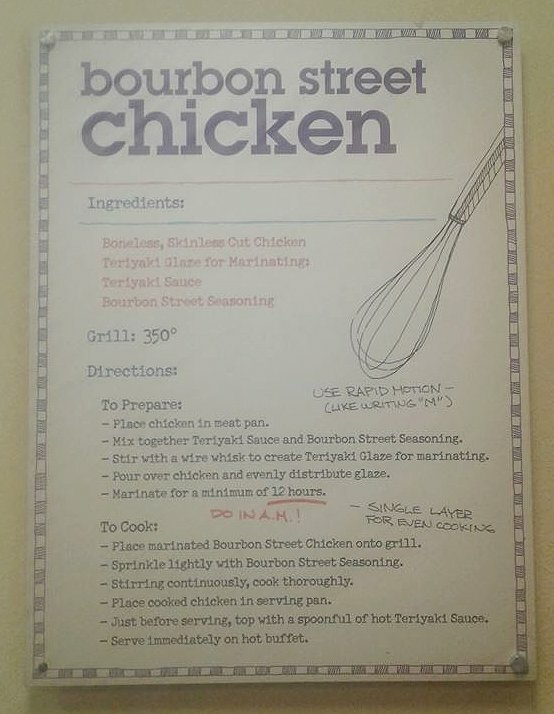 I love this Golden Corral Bourbon Street Chicken recipe! This is a dish that I think my family will enjoy. Thanks for sharing. Will definitely give it a try! Thank you and enjoy them, Cara! This looks delicious! I’m adding it to my list of things to make this week.